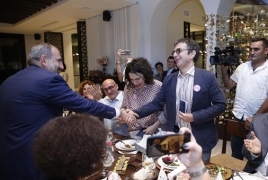 PanARMENIAN.Net - Prime Minister Nikol Pashinyan has handed out Armenian passports to Canadian-Armenian filmmaker Atom Egoyan and his wife, actress Arsinée Khanjian. Egoyan and Khanjian, both citizens of Canada, received special status passports in Armenia back in 2002, when dual citizenship was not allowed in the country. A spokesman for the Prime Minister, Arman Yeghoyan broke the news on his Facebook page, also posting pictures from a special reception in Yerevan.